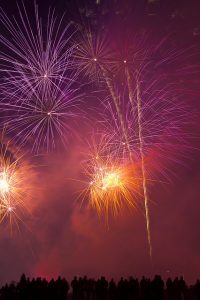 While some pets aren’t bothered much by the flashes and booms of fireworks, others become extremely anxious and are startled by the sudden unexpected sights and sounds. So, even if you feel confident that your pet wouldn’t bolt from you or your home, it’s better to be safe than sorry. Have your precious fur baby microchipped or equipped with a clearly marked ID collar should he unexpectedly escape. Prepare your home in advance – close windows, blinds, and drapes. Make sure your dog can access his crate or create a quiet safe place in your home with a favorite toy, blanket or extra-special treat. Play music or turn on the TV to drown out the outside sounds – some dogs are familiar with a loud action movie on TV while others might prefer soothing music playing in the background. Stay home with your pet if possible – keep yourself calm and follow a normal routine. Before fireworks begin, have your dog take care of “business” but if you do need to go outdoors during the celebration, make sure your dog is securely leashed. Increase your pet’s activity during the day – take longer walks and include extra play time to tire your pooch out early. If you are away during the holiday – ask at the boarding kennel if measures are taken to protect your pet from the noise and how they will help your pup remain calm and secure. 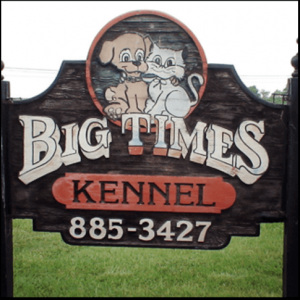 At Big Times Kennel in Dayton, Ohio, your pet’s well-being is our first priority. Your dog will have 11 hours of outdoor access during the day in a secure double-fenced area, as well as playtime with our caregivers, to promote plenty of activity and exercise. By the time celebrations begin, pups will be tucked into their own comfortable, climate-controlled suites and ready for a good night’s sleep. As an extra precaution, we play soft rock music to keep them calm and diminish the sounds of fireworks. Also, if anxiety medication is required to keep your pet calm, let us know. Our staff at Big Times Kennel is trained to administer meds as long as you provide a bottle with clearly marked detailed instructions from your veterinarian. Call us today at 937-885-3427 to reserve your pet’s Independence Day suite. For detailed information about dog boarding accommodations and amenities, visit our website at bigtimeskennel.com. Feline friends are welcome too! Suites fill up quickly during the summer months, so complete your vacation plans by reserving a spot for your pooch or kitty while space is still available.